Oxycodone and Hydrocodone are both synthetic opioids that are prescribed by doctors primarily to relieve pain. They are also frequently abused opioids by all demographics across America. Many people use Hydrocodone and Oxycodone interchangeably when despite their similarities, they are two different drugs that can be used to treat similar conditions like chronic pain, pain from a trauma or injury and post-surgery pain. Oxycodone is another prescription pain reliever that is very similar to hydrocodone. Unlike hydrocodone, oxycodone is available as an instant release drug where the effects begin after 10 to 30 minutes and the peak of the pain relief is felt after 30 to 60 minutes. The effects of instant release oxycodone typically last 3 to 6 hours. It is also available in an extended release form and is typically prescribed to be taken on a schedule every 12 hours. Oxycodone is taken orally, and in the United States it is available in tablet forms and oral solutions. Oxycodone is derived from the alkaloid thebaine that is also found in the opioid poppy. This alkaloid also binds to the opioid receptors in the central nervous system of our brains. Once the opioid receptors are activated, the effects of the drug are distributed to the skeletal muscles, liver, intestinal tract, lungs, spleen and the brain. Because the brain receptors are being redirected to work on relieving pain, oxycodone has been known to slow down the respiratory system and can act as a cough suppressant. The body metabolizes about 95% of the drug as opposed to the 20 to 50% that hydrocodone metabolizes, and the remainder leaves the body through urination. Oxycontin is the brand name of oxycodone that many people are familiar with. 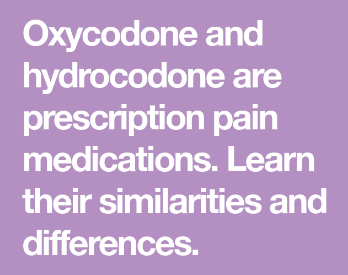 Oxycodone is also the active drug in Percocet and has been proven to be 1.5 times stronger than morphine. It is also considered a schedule II drug due to its high likelihood of being misused but is still approved for medical use. Oxycodone is also commonly combined with acetaminophen, a painkiller that does not contain opioids, to make a special type of medication that physically calms a person’s mood so that they pain medicine has enough time to work. Oxycodone is the most commonly abused recreational opioid in America. Hydrocodone is a powerful prescription opioid that is intended to relive mild to moderate pain. It has also been found to act as a cough suppressant but is more commonly used to relieve pain. This drug exists in an extended release form, meaning the medicine is slowly entered into the blood stream over time rather than all at once. People who are taking this drug begin to notice the effects after 10 to 30 minutes of taking it and they typically last anywhere from 4 to 8 hours. Hydrocodone is made from one of the alkaloids that are found in the opioid poppy known as codeine. This alkaloid works to relieve pain by binding itself to the opioid receptors that are in the central nervous system. These opioid receptors are responsible for the body’s perception of pain among other important roles and can be activated naturally by endorphins, dynorphins and enkephalins. When the alkaloid codeine enters the body, it activates these opioid receptors and give the person taking the drug the relief from pain. While everybody’s bodies react differently to the drug, anywhere from 20 to 50% of the drug is bound to the proteins in the body and is active in the pain relief and then metabolized in the liver. The rest exits the body through urination and is never metabolized. Hydrocodone is the active ingredient in many popular name-brand pain relievers, such as Vicodin and Zohydro ER. In 2014, the Federal Drug and Food Administration (FDA) approved of Zohydro ER to be used as a pain reliever. This was considered controversial because the drug contains a high amount of hydrocodone and was linked to addiction. Around this time, hydrocodone went from being a schedule III drug to a schedule II drug, meaning that it has a high chance of being misused and could lead to addiction, but is still approved for medical use. Hydrocodone is also sometimes combined with antihistamines which works as a cough suppressant that can also relieve the pain that is caused by the cough. People who abuse hydrocodone and oxycodone or use it recreationally describe the high as “euphoric.” Feelings of relaxation and sedation have also been reported during an opioid high which are very alluring to those who live high-strung or stressful lives. People have also experienced an uplift in their mood and a general overall sense of well-being while using drugs like hydrocodone and oxycodone to get high. People who abuse oxycodone and hydrocodone experience the same type of high as people who use heroin because it affects the same neuro receptors in the central nervous system. While the opioid receptors in the brain are responsible for pain, they also control behaviors and emotions involving rewards and addictions. The mu-opioid receptor is responsible for the reinforcing behavior of the drugs euphoric high the person experiences. Every time a person uses the drug to reduce pain or experience the other effects of the high, the mu-opioid receptor is activated and remembers that the oxycodone or hydrocodone are associated with that feeling. The delta-opioid receptors are responsible for regulating the emotions that a person feels, such as anxiety and depression. These feelings that any person could be experiencing subside when they enter their high. Following that high, the delta-opioid receptors will remember that the opioid eases those uncomfortable emotions, leading the person to crave another high. One of the main differences between hydrocodone and oxycodone when it comes to seeking a high is the strength of the overall drug. Oxycodone is 50% more potent than hydrocodone, therefore a lower dosage of the drug may be required to reach the same effects. The different side effects that each of the opioids yield are also one of the main differences between hydrocodone and oxycodone. Like all drugs, hydrocodone and oxycodone both have side effects that can become more severe with constant usage. Not every person who takes these drugs will experience every side effect, but they will have a greater likelihood of experiencing these symptoms while taking it, whether they have a prescription or not. If used as prescribed these symptoms can be minimal, but if these drugs are misused or abused frequently the side effects will likely be more severe. The most common side effects people who take hydrocodone experience are constipation and nausea. These side effects almost always go away on their own and do not require medical attention. Other common side effects that may require a doctor are fever, chills, body aches, unusual weight loss or weight gain, tightness in chest and tingling in hands and feet. Other important side effects to look out for when using hydrocodone are the signs of overdose. These signs are more serious than the side effects of regular, prescribed usage like blue lips, dizziness, loss of consciousness, confusion, decreased awareness, dizziness, increased sweating, irregular breathing and constricted pupil among others. If you suspect that you or a person you know is experiencing signs of a hydrocodone overdose, it is important that you seek medical help immediately. Much like hydrocodone, oxycodone has several side effects that are common and do not require medical attention since they go away on their own. Some of these include nausea, vomiting, loss of appetite, dry mouth, constipation, dizziness, stomach pain, drowsiness, weakness and sweating. However, there are also side effects that are important to watch out for as they are more serious and require medical attention. These include irregular heartbeat, itching or the development of a rash, chest pain, seizures, extreme drowsiness, difficulty breathing or swallowing and lightheadedness. Oxycodone also holds the potential for overdose and it is extremely important that anybody that suspects themselves or somebody that they know as having overdosed seeks medical attention as soon as possible. Some important overdose signs to look out for are difficulty, slowed or stopped breathing, dizziness, faint or weak muscles, narrowing or widening of the pupils, cold or clammy skin, slowed or stopped heartbeat and loss of consciousness. After any prolonged use of opioids like hydrocodone and oxycodone, a person will likely experience withdraw symptoms while they are transitioning off the drug. To try and lessen the effects, doctors may prescribe progressively lower doses of the drug until the person can fully sustain themselves without the pain reliever. Some common symptoms a person withdrawing from hydrocodone may experience are anxiety, runny nose, chills and sweats, muscle cramping, diarrhea, insomnia, stomach cramps and loss of appetite. The symptoms of oxycodone withdraw are very similar to hydrocodone and include sweating, muscle aches, watery eyes, runny nose, nausea and restlessness. The United States of America is currently facing an opioid epidemic that has lasted for decades. It is estimated that over 115 people die every year from an opioid overdose and the nation has declared the epidemic a public health emergency due to this growing crisis. Hydrocodone and Oxycodone are just two of the many opioids that are being abused by the population. In some cases, a person may be abusing a prescription opioid and not even know it. If they are taking the medication more frequently than prescribed, taking higher doses, or using it in any way other than what is prescribed by their doctor, they are abusing the drug, which could easily lead them down the path to addiction. The signs of an addiction to hydrocodone and oxycodone may be difficult to spot, especially if the person is being prescribed the drug by a medical professional. Some of the sings may be easier for a doctor to pick up on, such as exaggerating symptoms of pain or lying about an injury to get a higher dosage or more of the drug, requesting frequent refills or seeing two or more doctors to receive additional prescriptions. Other symptoms of an addiction are more social and could be detected by the people close to the addict such as social isolation, spending money quickly, drastic changes in mood with no other explanation and being overly focused on where and when they are going to get more of the drug. While not the most frequently abused drug, hydrocodone has been widely misused across all demographics. In 2013, over 4 million people older than the age of 12 admitted that they have used hydrocodone not as it is directed for recreational purposes. The American Association for Poison Control Centers reported that in 2012, they treated over 29,000 hydrocodone-related exposures. Also in 2012, the Drug Abuse Warning Network reported there were an estimated 82,000 cases of emergency room visits that were the result of the misuse of hydrocodone for non-medical purposes. Oxycodone is the most commonly abused opioid in America, and nobody is immune to its highly addictive qualities. According to a 2013 study, over 6 million people over the age of 12 have admitted to using oxycodone for recreational purposes at some point in their lifetime. Around 492,000 people over the age of 12 reported to having used the drug non-medically within the last month of the study. It was estimated that 65,000 emergency room visits in 2012 were due to the misuse of oxycodone. It is also reported that almost 14,000 of those oxycodone-related emergency room visits in that year were the result of a suicide attempt by using oxycodone. Methadone is a drug that is used to aid in opioid treatment because it cancels out the effects of both hydrocodone and oxycodone as well as other opioids like morphine and heroin. It works by binding to the opioid receptors to end the euphoric and sedative effects that opioids cause in the brain. Methadone has also been proven to help end the craving for opioids more effectively than any other medical treatment. Methadone can also help to relieve the symptoms of opioid withdraw so that a person can transition from their dependence to the drug more successfully if the correct dosage is used. Methadone is available in a liquid, pill and injectable solution that can be administered by a doctor. It is recommended that people with an opioid addiction or dependence do not use methadone for longer than 12 months at a time because methadone has the potential to be addictive. Naltrexone is a short-term opioid antagonist is used by medical professionals to both stop and reverse the effects of opioids on the body. Naltrexone does this by binding itself to the opioid receptors in the central nervous system, the same ones that hydrocodone and oxycodone both bind to and changes the focus of those receptors away from the euphoric feeling that the person was originally seeking. Naltrexone can be given orally or through injection into the muscles and has been proven to decrease the desire for opioids and help to prevent an overdose. After administered, the drug will start negating the effects of the opioids after 30 minutes, but it could take a few weeks for a person using hydrocodone or oxycodone to stop craving the drug. One negative effect found in people who were taking naltrexone regularly to decrease opioid cravings was the intense craving experienced by missing just one dose. Therefore, naltrexone is used in more short-term situations to curb symptoms of overdose or other dangerous effects rather than as a long-term treatment for addiction. While these medications can be helpful, detox is still one of the most effective and important steps in overcoming any type of addiction. When a person is going through detox, they usually stay supervised in a hospital or medical center to give their body time to rid itself of the opioids. Detox can take anywhere from 3 to 10 days depending on the severity of the use of the hydrocodone or oxycodone. While detox is both a safe and important step in the recovery process, it is important that it is done under the supervision of a medical professional, not at the addict’s own discretion. Depending on the severity of the drug, the person may seek inpatient treatment following their detox. Inpatient treatments can last anywhere from 6 weeks to a year and the patient will work individual and in groups with a team of medical professionals while they are working on their sobriety. Others may choose to go right to outpatient treatment where they visit a therapist once or twice a week to help them stay away from the opioids that they were previously so reliant on. The length of inpatient or outpatient treatment that a person may seek is dependent on their individual relationship with the specific opioid and any other co-occurring mental disorders or other issues that they may be dealing with. Of course, because everybody’s experience is different it is impossible to say exactly how each person should approach treatment for a hydrocodone or oxycodone addiction, so it is always best to seek professional help first.